STEPANAKERT (RFE/RL)–Russian–US and French mediators from the Organization for Security and Cooperation in Europe will on Sunday launch a new round of shuttle diplomacy aimed at brokering a peace deal on Nagorno-Karabakh–the authorities in Stepanakert said on Tuesday. The president of the Nagorno-Karabakh Republic–Arkady Ghoukassian–told reporters that the three co-chairs of the OSCE’s Minsk Group will begin a tour of the Armenian–Azeri and Karabakh capitals to discuss the peace process. The mediators will thus pay their first joint visit to the region in more than a year. Ghoukassian said the US chief negotiator in the Minsk Group–Carey Cavanaugh–will arrive in the Karabakh capital Stepanakert on Friday in what he called a "special visit by the American side." Armenian Foreign Minister Vartan Oskanian said late last month that the Russian–US and French mediators will not focus on concrete peace agreemen’s during the upcoming visit which he said will have a "consultative" character only. The Group’s most recent peace proposals on Karabakh were unveiled during the co-chairs’ previous tour of the region in November 1998. The plan is based on the idea of a "common state" to be formed by Azerbaijan and Karabakh which broke away from Baku’s rule in the late 1980s. The formula was largely accepted by the Armenian side but was unacceptable to Azerbaijan. A series of direct talks between the presidents of Armenia and Azerbaijan in recent months have considerably improved prospects for a settlement of the Karabakh conflict–which is vital for stability in the entire South Caucasus. 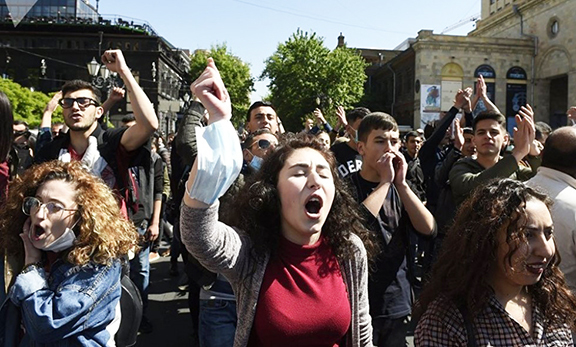 However–the process was slowed down by the October 27 killings of Armenia’s prime minister–parliament speaker and other officials. But Ghoukassian insisted that the summit was a step forward in that it made no reference to Azeri sovereignty over Karabakh in its final declaration. During the previous OSCE summit held in Lisbon three years ago–Armenia vetoed a clause upholding Azerbaijan’s territorial integrity in the conflict. "Istanbul buried Lisbon and there can be no return to Lisbon," Ghoukassian said. He went on to argue that the wording of the latest OSCE documen’s "allows Karabakh to continue its struggle for independence." He reiterated that the conflict’s resolution is impossible without Stepanakert’s involvement in peace talks. Commenting on the political situation in Armenia after the assassinations–the Karabakh leader admitted the existence of "certain internal tension" there–adding that the Karabakh authorities will try to help defuse it. "We enjoy a fairly high [approval] rating in Armenia–and our task is to use it as a stabilizing factor," he said.